How do I calculate my best theoretical lap? Step 1: Enter the Results menu at the top of the screen, and select the "Summary statistics" option. Step 2: This will open up a window. Press the downwards pointing arrow near to the top, left hand corner of the window to open up a sub menu. 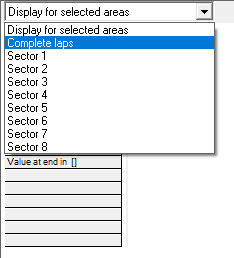 Now select "Complete laps". 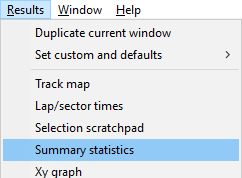 Step 3: The "Summary Statistics" table will now expand, showing, among other things, the best theoretical lap.